The photo of Baby Olivia with Mommy Andi Manzano was taken during Mother's Day. The photo on the right was her OOTD when she and her family went to Hong Kong. As of June 13, 2016, Instagram’s most followed baby remains Olivia Manzano Reyes, who has 210,000 followers. She is the daughter of DJ/host Andi Manzano and businessman GP Reyes. 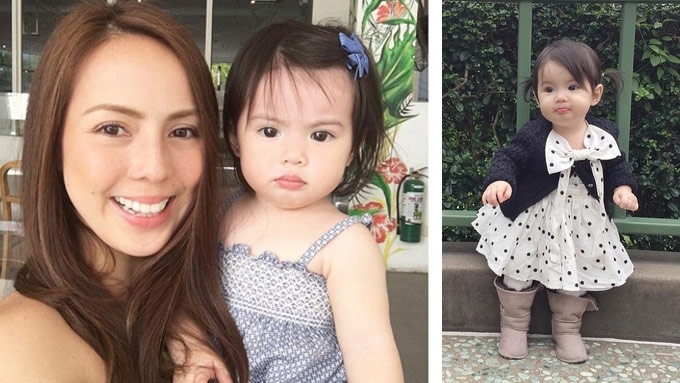 At the launch of GlaxoSmithKline’s “You Can and You Will” campaign against cervical cancer, PEP.ph (Philippine Entertainment Portal) asked Andi how her daughter became a social-media superstar. Smiling, Andi shook her head and said it was not planned at all. Olivia is not exactly part of showbiz, but her popularity goes beyond cyberspace. The thought of having so many people feel concern for her daughter makes Andi very happy. She resumed, “How much they adore her and how they saw her grow up into that tiny baby, now she’s already walking, it’s nice to have people love her, at the same time, it’s overwhelming. Now here are five things we should know about Baby Olivia. 1. Baby Olivia was offered to star in a reality show and a movie. But Andi said, “we’re just really enjoying her. “It was just like an idea but we were thinking she’s still so young. 2. About ninety-nine percent of her Instagram photos are candid. Andi related, “There’s no production involved kasi when my sisters sleep over, they’re the ones taking photos of Olivia. “Sometimes, they like dressing her up. “Or sometimes, before we go out, they dress her up and they take her photo. But her “first month, second month, third month, and so on” photos were planned. 3. Her Instagram account @oliviamreyes was originally intended “just for us,” said her mommy. Andi continued, “So it started out with, you know, us posting every day. “Nagulat na lang kami, ‘Oh, she has five thousand followers,’ and later on, she has twenty thousand! "So talagang it just blew up in a good way. “And it’s nice that people really love her." 4. Olivia does not have bashers. She continued, “Hanggang ganun lang! “Which I think people shouldn’t do. “It’s just like, say ‘mas maganda ka dito,’ di ba, or ‘she’s prettier than you’ whatever. 5. Daddy GP makes the decision whether Baby Olivia will be allowed to enter showbiz or not. 6. Eventually, Andi and GP will set restrictions on which photos will be posted on Olivia’s Instagram account for the baby’s privacy and security. In the meantime, Andi has been enjoying and savoring her moments with Baby Olivia. “Motherhood, it’s actually the best thing that happened to me. “It’s so fun being a mom that I never expected to be a hands-on mom, actually. Olivia also makes Andi appreciate all the other moms in the universe. “ Yeah, I’m so in love with her! “And it’s nice to see yung every milestone, every step you’re there. “It makes you appreciate your mom and all the moms out there and how hard they work, especially when your mom has to work, she has to leave her kid at home. Imagine how hard that is!